Playing at the Tarragon Theatre is a production that is quite revolutionary: the first Chinese language musical performance to grace the Tarragon stage, and one that already delighted audiences at the SummerWorks Festival in 2016. Mr. Shi and His Lover, written by Wong Teng Chi, captures the unique facets of Chinese opera that have always spoken to me — bold bravado and delicate nuance — in ways that will entice and intrigue western audiences. Based on a true story that was adapted into the play M. Butterfly by David Henry Hwang and featuring live chamber music performed on stage, this performance blends traditional Chinese opera with modern pop seamlessly. Mr. Shi and His Lover is alluring and a pleasure to watch. Mr. Shi and His Lover is about a French diplomat Bernard Boursicott (Derek Kwan) and his relationship with Shi Pei Pu (Jordan Cheng), a singer from the Peking Opera. Their love blossomed while Boursicott held post in China and it wasn’t long before Shi declared she was pregnant with Boursicott as the father. Later on, Boursicott is accused of passing classified information about the French to the Chinese through Shi and they are both arrested by the French government on charges of espionage. During the ensuing trial, a big revelation comes to light — Shi was a man and hid his gender during the 20 years of their relationship. The production begins at this point and is told in a series of vignettes exploring the various aspects of Boursicott and Shi’s relationship: the emotional battle of love, hate and betrayal; lamentation and despair at their current existence; reminiscing on the past; and questioning whether they still feel love. The scenes are nonlinear, filled with introspective monologues and narratives. The focus here is not on the plot but on these two individuals — their minds, their emotions, and their bond both strained and everlasting. What I love the most about Mr. Shi and His Lover is how simplistic the whole production is, and yet still richly nuanced and emotional. The staging is minimal and much of it is used by the two musicians — piano and percussion by composer and music director Njo Kong Kie along with marimba and additional percussion by Yukie Lai — delivering the score. There is plenty of room here for Cheng and Kwan to explore and breathe life into these two pained characters. And they both accomplish this sublimely. Cheng’s performance, in particular, drew me in and I found myself locked on him throughout. His performance of Shi is coy, demure and yet mercurial at the same time. On the other hand, Kwan is far more grounded as Boursicott, and often his anger is what drives him. My guest for the evening, Mirette, commented on how multi-faceted both these individuals were and how the subtleties of their characters reveal great emotional depths. The performance is accompanied with surtitles in both English and Chinese with the production performed in Mandarin. I don’t speak Mandarin so I relied on the titles. As is often the case with watching subtitled films, I find I usually end up focusing on one thing or the other, reading or watching the actors. Often I’d get caught up with watching the subtleties in Cheng’s movements and facial expressions, losing myself in his work that I would miss pieces of the translation. Njo’s score, blending vintage western pop music with traditional Chinese opera, is beautiful. The blend is effortless and periodically I would hear a tune I recognized. The music–in particular, the percussion–accompanies the staccato talk-singing effect that is ubiquitous to Chinese opera. After the performance, Njo announced that a soundtrack would soon be available, much to the delight of many in the audience. 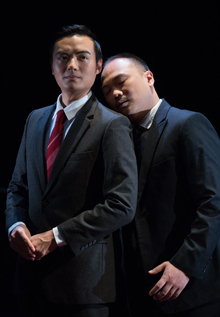 Mr. Shi and His Lover is beautifully performed and certainly worth seeing. I highly recommend that you do. Mr. Shi and His Lover is playing at the Tarragon Theatre Main Space (30 Bridgman Ave) until December 17, 2017. Performances run Tuesdays through Saturdays at 8:00 pm with weekend matinees at 2:30 pm. Tickets are $55, $49 for seniors 65+, and $29 for students. Tickets can be purchased online, by calling the box office at 416 531 1827, or in person at the box office.